Do you look at your kitchen and feel like it needs a little something? Good news, friends! There are SO MANY simple things you can do to give your kitchen a fresh look. Here are just a few ideas to spark imaginative, detailed work in your Greater Lafayette, IN area kitchen. This list includes upgrades and renovations of all shapes, sizes, and financial budgets. However, all have one thing in common: they’re relatively simple to design and accomplish in your home. For your information, the kitchen designers at Home Depot offer free consultations. This is a great resource to grab hold of when planning the details of your kitchen upgrade. Let’s start with paint. Paint, paint, and more paint will lift your kitchen’s ambiance. Paint on the walls and cabinets make everything look new. Click here to view a step by step guide to painting your cabinets! Add a backsplash. Backsplashes can be simple to put up, and as we said before, it can provide a pop of color for you kitchen. Click here to view some backsplashes for all kitchen types. Fun comes when you use dry erase boards of chalk paint for the interior cabinet doors. Use this space to create grocery lists, meal plans, or love notes for your spouse. Add lighting! Lighting gives dimension to your counter tops, cabinets, and backsplash combinations. 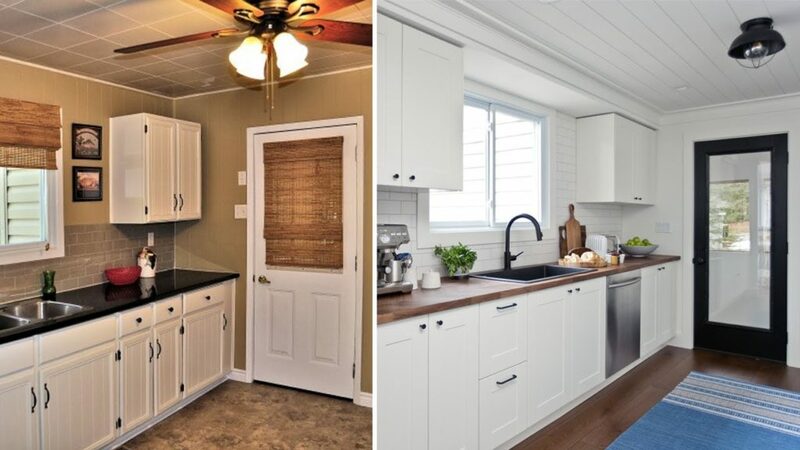 Add lighting under your cabinets, replace outdated lighting from your ceiling with industrial-modern lighting, or if you’re feeling really ambitious, add can lighting. Add details in your storage. Less is more when it storing kitchen items on your counter tops. You need all the counter space you can get! Add detailed storage such as drawer dividers, lazy susans, or cabinetry with extra shelving for more secret storage solutions. Storage can also hang from the ceiling over islands and in open parts of the kitchen. Click here to view some ideas on kitchen hanging storage. An obvious upgrade includes appliance replacement. New appliances, specifically matching appliances, tie the kitchen details together. This doesn’t always have to break the bank. Check second hand stores, such as the Lafayette, IN Habitat Restore, for great deals. Simple decor such as new valences, blinds, or cabinet hardware can lift the face of your kitchen. These things will tie in all of your new, more dramatic upgrades. Lastly, we want to always encourage you to be creative! The best part about these projects in your home, is just that- these are YOUR projects in YOUR home! Be sure to make everything you do here personal and purposeful. This will make your home unique, and give you the detail you’re looking for to make this kitchen fresh, inviting, and YOURS!